Welcome to the Daggerspell Reread and Review Series, with Aidan Moher (your humble editor/blogger) and Kate Elliott (author of lots and lots of cool novels)! We thought it would be fun to bring two different perspectives (someone who’s read the series, someone who hasn’t), and explore Daggerspell together, comparing notes and reflecting on a series and world that are held dearly by many readers. We’re also hoping that, if you’re not familiar with Kerr, you might discover a new favourite author. So, spurred by Kate’s enthusiasm, and my own nostalgia for traditional ’80s-style epic fantasy, which I grew up on, but haven’t been reading much of in recent years, I decided to hunt down some paperbacks of the first two books, Daggerspell and Darkspell, to give them a shot. Fast forward a couple of days, and a couple of hasty emails, and I found myself working alongside Kate in this reread and review series. Terry Brooks’ Shannara series is another ’80s epic fantasy staple that I hold near-and-dear to my heart. I can’t ever expect another series to capture me in the same way that Brooks’ did when I was a child, but to head into a similar series alongside a passionate fan seems like the next best thing. When it all boils down, epic fantasy, particularly the kind that was popular in the ’80s and ’90s, is my favourite genre, and I’m looking forward to sinking into one of its best series. As Kate Elliott, I have written a number of fantasy and science fiction novels including the Afro-Celtic post-Roman icepunk Regency fantasy adventure The Spiritwalker Trilogy (Cold Magic, Cold Fire, Cold Steel), and the epic fantasies the Crossroads trilogy (starting with Spirit Gate) and the Crown of Stars series (starting with King’s Dragon). 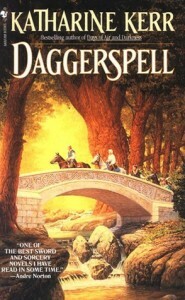 I read a library copy of Daggerspell soon after it was published in 1986. I can still envision the library and the shelves where I found it. I enjoyed Daggerspell so much that I read the second volume, Darkspell, as soon as I could get it. My own first novel, Labyrinth Gate (published under a different name), came out in late 1988, and because Katharine Kerr and I at that time lived in the same general area we were somehow tapped to do a signing together, possibly at Future Fantasy Bookstore in Palo Alto but more likely at a mall bookstore. Kit and I hit it off at once and have been close friends since. I consider the Deverry sequence a criminally under-rated and overlooked epic fantasy sequence. It has a keen sense of history, well drawn characters, and a complex plot. I’ve wanted to reread it for a while partly because most of the later books I read in draft form rather than in final published form so I want to read the finished version but mostly because I want to revisit a series for which I have exceptionally strong and positive memories. If this read and reread brings new readers to this great series, then I’ll be happy. Even as a young girl, Jill was a favorite of the magical, mysterious Wildfolk, who appeared to her from their invisible realm. Little did she know her extraordinary friends represented but a glimpse of a forgotten past and a fateful future. Four hundred years-and many lifetimes-ago, one selfish young lord caused the death of two innocent lovers. Then and there he vowed never to rest until he’d rightened that wrong-and laid the foundation for the lives of Jill and all those whom she would hold dear: her father, the mercenary soldier Cullyn; the exiled berserker Rhodry Maelwaedd; and the ancient and powerful herbman Nevyn, all bound in a struggle against darkness. . . and a quest to fulfill the destinies determined centuries ago. Here in this newly revised edition comes the incredible novel that began one of the best-loved fantasy seers in recent years–a tale of bold adventure and timeless love, perilous battle and pure magic. For long-standing fans of Deverry and those who have yet to experience this exciting series, Daggerspell is a rare and special treat. Note: All of these page numbers are based off of my paperback of the revised edition of Daggerspell. Want to be a part of this Daggerspell reread and review series? It’s easy! Just pick up a copy of the book (link below) and follow along to the schedule above (or, read ahead and come back here to join us on schedule), and then join us in comments of our reflections with your own impressions. Whether you’re new to the series (like me!) or a veteran (like Kate! ), it’ll be great to have more voices involved in the discussion. Together, Kate Elliott and Aidan Moher form some sort of super team. They'll get back to you with their specific superpowers and motives at a later date. Glad to see you start this up. I’ll give it a go. I’m struggling to read at the moment, but I bought myself an ebook copy of the first book when Kate mentioned the series in her post so I’ll see how I go. I know I read the first three books in the 80s but can’t remember beyond that. I love these books so much. Looking forward to the reread. Can’t wait to hear what you have to say. No similar praise for me, Kazz? My heart breaks. Yeah I need to read her books myself. I’ve read the first 4 novels in this series, and have been off and on desperately searching for the sequels. The way time move and works in the narrative was hard to get used to at first, but eventually I got the hang of it. I don’t know if I’ll have the time to read along, and my dog kind of ate one of the books, but I will gladly read the blog as you guys do this. I loved this series. Figures I’d be on vacation for most of this. This is a fabulous idea, though, Kate and Aidan! How many books do you plan to go through? Definitely Daggerspell and, depending on feedback and how much we enjoy it, Darkspell, too. Though that might come later in the year. I’m already well into the series now, based on Kate’s post. So much so that I find myself starting sentences with “Here,…” But I’ll be happy to join in if I can. This sounds fantastic. I got the books and will try to keep up with the rereads. I’m in! I’ve been wanting to read this for yonks and now I have a reason to move it up the stack! I’ll give it a go. Last read the book almost 20 tears ago. Hopefully I can find the time to keep up. Loved it first time around – I really hope the book stands the test of time. Many don’t. I’m in. Never read Kerr before, yet I’ve always wanted to give her a go. You have inspired me to my third read!